Borosilicate glass powder funnels, useful for the introduction of solids or liquids into reactions under atmospheric conditions. 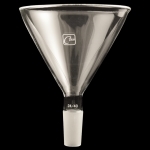 Funnels have 60 degrees side angle and a standard taper inner joint. Diameter 50mm. Inner joint size 14/20. Diameter 50mm. Inner joint size 19/22. Diameter 75mm. Inner joint size 24/40. Diameter 120mm. Inner joint size 24/40.